Hyundai made headlines last year with the introduction of the Veracruz crossover. The Veracruz offered the styling and features of the Lexus RX for thousands less. 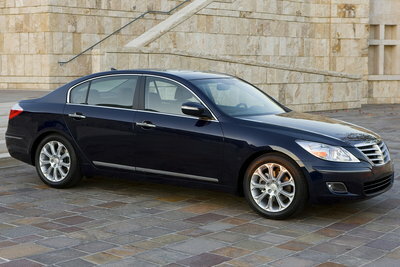 Enter the Genesis sedan, which goes after the E-Class and 5-Series in a similar fashion. The Genesis sedan is a large mid-sized vehicle that rides on a all new rear-wheel-drive platform which features an independent 5-link suspension in the front and rear. Engine choices include a 3.8L V6 and a new 4.6L V8. The V8 is rated at 375 hp on premium fuel. The Genesis sedan offers a host of upscale luxury features including Smart Cruise Control, HID headlamps, and a Lexicon audio system featuring LOGIC 7 technology. With pricing in the $30,000 range, the Genesis is sure to snag some buyers in a burgeoning luxury market. The Genesis is an all-new RWD flagship sedan from Hyundai. Engine choices include a 290-hp 3.8L V6, and a 375-hp 4.6L V8. A six-speed automatic is standard.